According to Ayurvedic philosophy, choices that you make regarding your daily routine either build up resistance to disease or tear it down. This is why you should start your day by focusing on healthy morning rituals such as drinking pineapple water on an empty stomach. Pineapple offers a rich source of some of the lesser known micronutrients that your body needs. Pineapple is packed with the enzyme bromelain and the antioxidant vitamin C, both of which plays a major role in the body’s healing process. Pineapple contain potassium which helps make our body a lot stronger and maintain the proper balance of electrolytes in your body preventing cramps or other injuries. Pineapple is loaded with fiber, beneficial enzymes and a host of antioxidants that help to detox your body from heavy metals and toxins. 7. Works as a digestive aid. 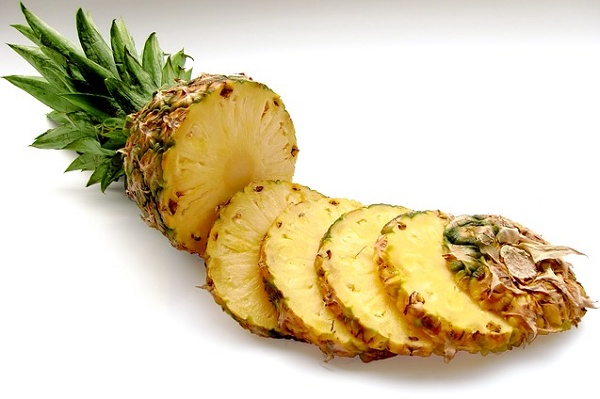 Bromelain in pineapple helps the body digest proteins more efficiently. Research found that the enzyme bromelain in pineapples acts as a natural stain remover, according to Dr. Frawley. Bromelain also helps break up plaque effectively.